If your tennis brain has only room for one takeaway from the U.S. Open, let it be this: Naomi Osaka was the most dominant player in the world over the last 14 days. With the exception of a fourth-round test of will, all of Osaka’s matches, including the final, were straight-set, open-and-shut, surgically efficient wins. Only once did any of her opponents win more than four games in a set. The crushing power and ambition of her playing style have long been a marvel to watch, and now she owns the major hardware to back it up. Prophecy is a finicky proposition in tennis, but Osaka would appear to have the time, the game, the head, and the camp to become a multiple-Slam-winning superstar. Nobody deserves to endure the boos of an entire stadium in the brightest moment of her professional life, much less apologize for that feat in her very first public statement. But she’ll be more than okay. Shoutout to Osaka, who hop-skipped over a minefield of tricky opponents and rhetorical traps and somehow did everything right. Things ended less happily for the subject of Osaka’s school project, who happens to be the woman she defeated in the final, who also happens to be the titan of her sport, Serena Williams. By now you should have seen what happened in the second set of the title match, with Osaka a set up. Williams was issued a first code violation for coaching when her coach Patrick Mouratoglou twice made a hand gesture suggesting she go to net, something he later conceded doing. Williams was issued another code violation for smashing her racket a few games later, and this second violation brought a penalty of one point. Williams was issued another code violation for verbal abuse after arguing at length with the umpire about the application of the first code violation, and this third violation brought the penalty of one full game. Williams said that the umpire’s officiating was sexist, asked for an apology repeatedly, and cited her child Alexis Olympia: “I have a daughter and I stand for what is right for her and I’ve never cheated.” Finally, she called the umpire a “thief,” the apparent trigger for the third violation. After tournament officials came onto the court and told Williams that none of the umpire’s decisions were reversible, the scoreboard went from 4-3 in the second set to 5-3, and about six minutes later, the match finally resumed. Williams held serve, and then Osaka held serve to take the title. Williams has since been fined $17,000 for her violations during the match. Thus began a take cycle of unusual breadth, depth, and heat, treating readers to a spate of opinions with varying levels of interest in the relevant factors: the rules of tennis themselves, how those rules are actually applied in practice, how this specific umpire has enforced those rules historically, the ways in which Serena Williams has faced racism and sexism through her career, and the testy relationship Serena Williams has had with officiating at this specific tournament. Some allowed the important values that Serena Williams stands for to occlude the particulars of the case at hand; some hit the nail on the head; some felt this was just an opportunity to vent some old-fashioned racism. Trawl around enough and you can find something that confirms the biases you want confirmed, that scratches the parts of your brain you wanted itched. For my part: 1) The umpire was obtuse to enforce the letter of the law to this extent and should have employed one “soft” warning in lieu of either the first or third code violation. 2) Williams, even in the most charitable interpretation, earned a point penalty. Both of these people are, to different degrees, responsible for derailing a match that should’ve had Naomi Osaka at its center. The umpire so far has taken the brunt of the scrutiny, as far as the sport’s governing bodies are concerned. Carlos Ramos, a notoriously stringent umpire of both men and women, was not publicly presented with a gift, as is custom during the post-match trophy ceremony. Since then, the USTA threw him under the bus, the WTA accused him of officiating men and women differently, and the ITF sedately applauded him for correct conduct. Full-throated support might not be forthcoming, as the optics of this situation are tricky. Williams is a symbol bigger than the sport itself and a large part of why so many eyeballs were on that match in the first place. Meanwhile, nothing Ramos did is wrong by the light of the sport’s rules, but the straightforward application of those rules has created a superficially absurd and unsatisfying result, which would seem to suggest that something is wrong on at least one of those levels, rule or interpretation. There is a clear mismatch between tennis as its fans want to see it, and tennis as it currently regulated—at least when players of a certain magnitude are involved. Rules could be changed, but probably won’t be. Ramos, who’s officiated during finals at all four majors, will probably be allowed to officiate as usual, without any repercussion and, in an unspoken way, may be steered away from Williams’s matches, until one day he isn’t. 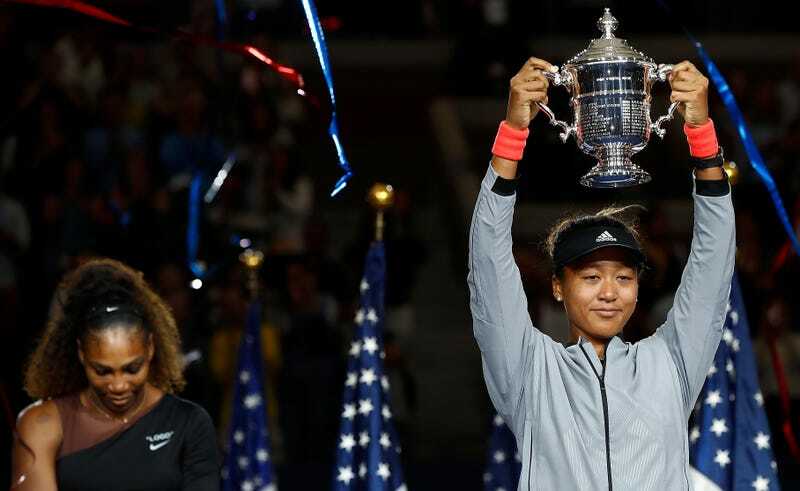 Hopefully, while all of that blows over, Naomi Osaka keeps winning.